This soon-to-be-classic picture book centers on a large, adoring family with a new baby to love. Rhyming couplets describe different scenes, each built around the simple human gesture of "reaching." A new mother reaches up to hold her laughing baby aloft. Dad reaches over to tickle Baby's toes as the family lounges on a picnic quilt. Grandparents, cousins and other family members reach out to play and cuddle with the growing child. The little one also gets to "reach," using his arms and hands to explore the wonderful world around him as he grows from a baby into a curious toddler. 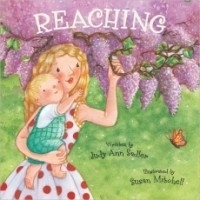 It's only a matter of time (Mom realizes wistfully) before he's "reaching" for the stars. Splendid, lush illustrations will immerse babies and toddlers in the story's beautiful, colorful world. This is a lovely picture book. A large, diverse family is beautifully illustrated, all showing love in various ways to baby before baby grows up and reaches for the stars on his own. The rhyming couplets flow smoothly, and the entire story is very sweet. My highest recommendation is this: I read it through to my two year old daughter, and she was so captivated that not only did she actively point out things she liked in the illustrations, but she took the book from me and sat down to re-read it multiple times on her own. Wonderful book.